The crossroads at the junction (A) between Cheadle Road / Hulme Hall Road / Albert Road and Turves Road has only become important in the last 100 years. Previously it was merely a track connecting Cheadle Village and the Hulme Hall area and did not lie on the main turnpike road which veered off from Cheadle at Schools Hill. 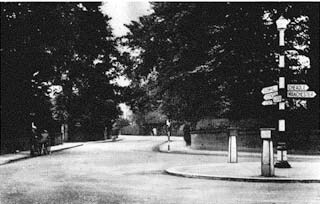 The crossroads (B) at Station Road / Queens Road / Ladybridge Road / Albert Road was even quieter in times gone by. These are now the busiest traffic junctions in the area feeding Manchester, Stockport, the Airport and local shopping areas. Crossroads (B) just before the traffic lights jungle was installed.